Video is one of the most engaging forms of content nowadays, and brands are finally starting to take notice. In fact, eMarketer predicts that U.S. video ad spend will climb from $4.14 billion in 2013 to $8.04 billion by 2016. One of the challenges with video marketing, however, is ensuring that the right content is shown to the right audience. This is where SundaySky can help, as the company’s SmartVideo offering helps brands connect with consumers in real-time through personalized video advertisements. SmartVideo, which has been around since 2011, enables brands to engage consumers with pre-roll video ads that are contextually relevant and delivered in real time. According to Kelly Ford, VP of marketing at SundaySky, the videos are personalized based on key data attributes, such as a consumer’s previous behavior, on-site activity and search history, to name a few. “From the moment a viewer clicks play the video is created especially for them using data about them, whether it’s their behavior or their purchase history or their account status,” said Ford. 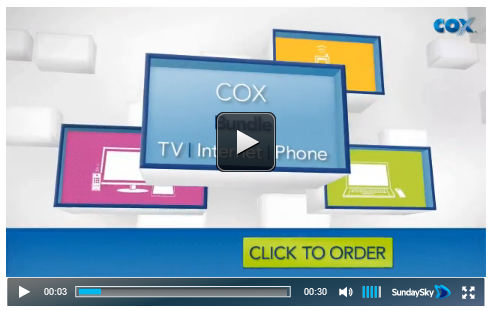 Cox Communications, for example, leverages SmartVideo to retarget customers who visit the company’s website and look into subscribing to a new cable plan. After the visitor leaves the Cox website, they are likely to receive a pre-roll ad specific to the behavior they displayed on the website. For instance, if the consumer was researching sports packages on Cox’s website and then looks up slam dunk videos on YouTube two days later, SmartVideo could deliver a personalized video ad providing information on Cox’s basketball package, which would be relevant to the consumer’s previous behaviors and browsing history. The personalized video ads can be leveraged to acquire new customers, retarget website visitors and drive repeat purchases. It is also important to note that the videos are featured on top publisher sites throughout the Web, including YouTube, The Huffington Post and Yahoo. According to Ford, the personalized SmartVideo pre-roll ads tend to perform very well, with an average click-through rate of 3 to 4 percent. Moreover, SundaySky’s website states that visitors who engage with the video ads convert up to 10 percent more and spend up to 30 percent more than similar visitors who didn’t receive SmartVideo ads.